First and foremost Germany is the official creators of the Rottweiler bloodline. The ADRK is Germany's founding organization for the Rottweiler breed and is the first official recorded and documented history of the breed standard, Although our dogs are exported here to USA we register our dogs and puppies with AKC. All our imports are DNA certified to assure you they are pure German and European bloodlines. We are a code of ethics Rottweiler breeder located here in Nashville, Tennessee that breeds both German Rottweiler bloodlines and European Rottweiler bloodlines that follow the ADRK and FCI standards. I strive to follow the standard exactly as is done by the ADRK in Germany, INCLUDING WE DO NOT DOCK TAILS ANY LONGER and we make sure the dogs are correct in head type and body structure no matter what country they originated from on the pedigrees. We do not breed extreme heads or overdone Rottweilers, therefore our Rottweiler puppies for sale will not have the smashed muzzles and buggy eyes. All our Rottweiler dogs owned by Von Der Musikstadt have certified hips by either Radkovic at 12 months, ADRK at 16 months, or certify the hips through Novak in Serbia. 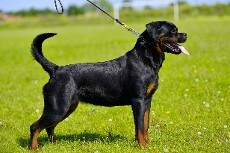 Our Rottweiler dogs have other tests offered by OFA for our breed. Check out our testimonial page to view satisfied responses from our buyers; we also have several references from other buyers whom you may contact before you buy a Rottweiler puppy. More than half of my buyers have seen my kennels and personally pet my dogs. Ajax von haus Drazic is one extraordinary Rottweiler male here in USA. He is set aside from the ordinary Rottweiler seen here in our country. This world class conformation dog has a very tolerant temperament with people. Ajax is the epitome of the Rottweiler breed showing his elegance, size, bone thickness, structure, and most important temperament. His genes produce dogs that posses strong prey and ball drive for schutzhund, focus for conformation, alert protective instincts, and outermost confidence. The Rottweilers we own all come from top world champions and famous kennels in Germany and Serbian / European kennels. Thanks to our friend in Serbia, Dusko, I want to give an unlimited amount of recognition for being a honest, hard working breeder and handler. He has shown and proved to not only me but to several breeders here in the USA for sending top dogs for us to show. He completely understands that we must have great temperament dogs here for companions. I am a Rottweiler breeder that is devoted to making the Rottweiler better as each generation is born. I am obsessed studying the bloodlines and breeders that each dog comes from that I buy. Countless hours on the phone with every puppy buyer making sure a Rottweiler is the right dog for your family. Countless hours of free information that I can imprint in your head about the Rottweiler that you need to know in keeping your new family member healthy and safe. More telephone hours on the phone even if you didnt buy a dog from me to help you resolve your problems about your puppy. When you call me I am a book of knowledge that will tell you exactly how it is in a nutshell and not sugar coat it. I will devote my time in telling you what you need to do to be the best owner a dog can have and not ask for anything. I've spent hours in the middle of the night helping people with problems if something happened. I try to answer every question to the best of my 24 years of knowledge, and if I cant answer it then I will search until there is no more searching! I answer questions from all breeders in Europe that need help. The references that I can give you will be from people that will tell you I am the best breeder. I will never tell you I have the best dogs in the United States because it is not true, because NO ONE has the best dogs. We ALL have the same dogs, but what they can't give you like I can is the lifetime friendship and loyalty as a breeder to tell you every nook and cranny of all hours. Other breeders won't give you the hours of phone calls because they simply dont care. Well, I care where my dog lives and I hope you respect how I feel and give me a chance to talk to you because I still will be your friend if you buy the puppy down the road, or a rottweiler puppy across the ocean. Copyright © 2007 - Present Von Der Musikstadt Rottweiler All rights reserved.